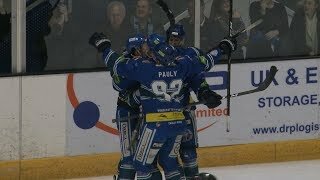 Two late empty net goals inflated the title chasing Belfast Giants' 4-1 victory over a battling Genting Casino Coventry Blaze at the SSE Arena on Friday night. Coventry traveled to the home of the recent Challenge Cup Champions without Justin Hache and Jake Hansen whilst the Giants were missing David Rutherford. There was also a surprise in the Belfast goal as veteran Brit Stephen Murphy started in place of standout import Tyler Beskorowany. 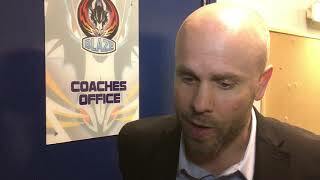 The opening period was a frustrating affair for Blaze as four powerplay chances went astray and the first Belfast goal coming short-handed through Blair Riley at 14.19. With 23 seconds remaining in the first and rink maintenance required, the players were sent to the locker room early and before the change of ends would take place Giants made it 2-0 through Darcy Murphy at 19.44. The Blaze got back into the game on 26.53 as their Man of the Match Ross Venus beat Murphy to make it 2-1. Despite Nicolai Bryhnisveen hitting the post just past the half way point, Coventry were unable to tie things before the end of 40 minutes. In the third, Venus was afforded two more glorious chances before Darcy Murphy hit Matt Hackett’s crossbar. Further opportunities came for Blaze with and without the man advantage but Belfast’s Man of the Match Murphy kept them at bay. With Hackett pulled Giants ended the game with two empty net goals through Jordan Smotherman (59.16) and Kyle Baun (59.57) for a final score of 4-1.